Home > car new update > Being this the concept of the Mazda RX - 9 ? Hay Bro Sis...Within the next two weeks Mazda will introduce a concept sports car is expected to be the successor to the RX-7 and RX-8 at the Tokyo Motor Show 2015. Photo teaser spread causing some speculation about how the design later. 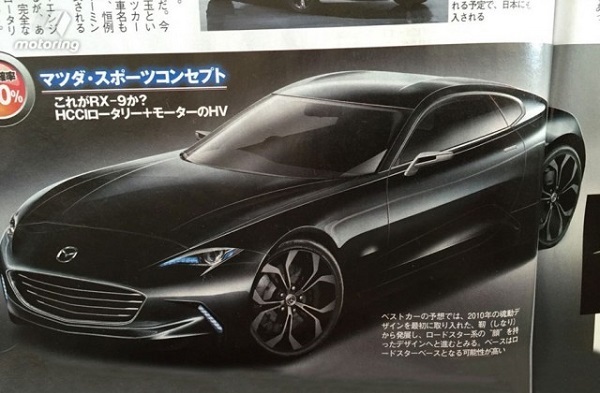 A Japanese-language magazine make predictions rendering a form called the car will be called RX-9. Rendering is made utilizing teaser photo that shows the silhouette of the back side. Carrying the body lines streamlined, candidate RX-9 is described as having Kodo design language, as seen on the front fascia similar to the latest MX-5, but with a longer bonnet. While stern sculpted as a fastback, followed by the rear lights is identical to that of the RX-7. Possibility of sport coupe concept has become the successor to the RX series of increasingly large after Mazda will ensure regenerates legendary rotary engine. The last time produced rotary engine Mazda RX-8 through the 2012 edition. Mazda also reported to release a new model rotary engine in 2017, to celebrate the 50th anniversary 110S Cosmo or the sports coupe Mazda's first rotary mass production in 1967 ago.